As a news correspondent, Bill later covered everything from presidential elections to street riots in more than 30 countries. He did a four-year stint as the BBC's Washington Correspondent - which included a rain-drenched appearance on Breakfast, live in the middle of a Florida hurricane. 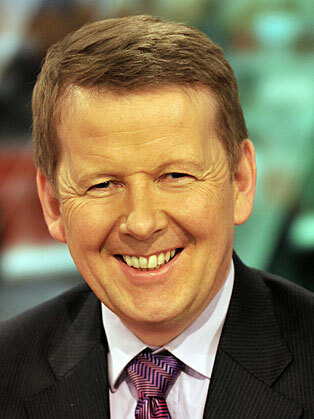 He has also been a regular presenter of the BBC News Channel and Radio 5 Live, before joining the Breakfast presenting team full time retiring 2016. He now hosts the BBC One quiz show Think Tank, and his own show on Classic FM. He has appeared on Celebrity Mastermind, Pointless Celebrities (alongside Sian Williams - they won! ), Room 101, and Would I Lie To You? He’s had cameo appearances on Doctor Who and in the video for Professor Green’s track Remedy. Away from the studio he’s written about his love of beekeeping in his book The Bad Beekeepers Club, and run the London Marathon five times. Accomplished live host, Bill combines professionalism with a perfect balance of seriousness and entertainment. After dinner he recounts a wealth of stories from his life in broadcasting.